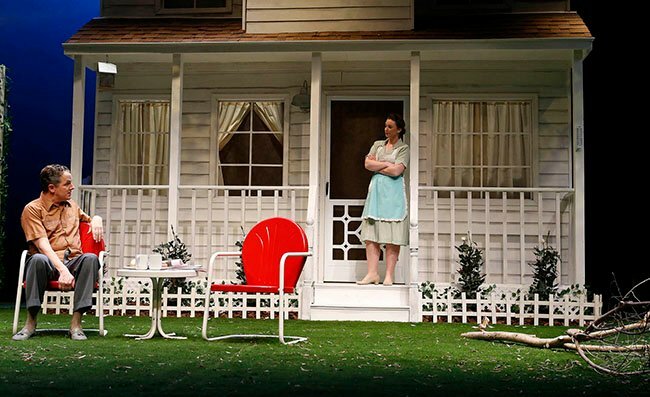 The elaborate set design is one of the many highlights of “All My Sons,” which opens Friday in Ethington Theatre. The words Claude Pensis uses to describe the College of Fine Arts and Production’s first main stage play of 2016, which opens this weekend in Grand Canyon University’s Ethington Theatre, may be worth the price of admission ($12 and under) alone. Joe Keller (left, played by Scott Campbell) shares a moment with Frank Lubey, played by Jeremiah Byrne. 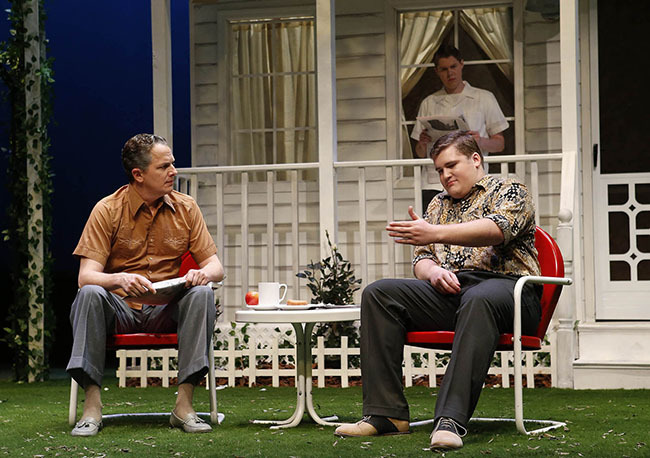 Based on a true story of an airplane manufacturer who conspired during World War II to sell defective engines to the U.S. military, “All My Sons” is the story of Joe Keller, the head of seemingly the ideal American family. He has a devoted wife, Kate, and two sons, the eldest missing in action in the war. Keller was exonerated of charges that he knowingly shipped damaged parts, which triggered air catastrophes resulting in the deaths of 21 pilots. Of course, the truth comes out, as it always does, and Joe Keller’s truth is no exception. The first of six performances of “All My Sons” is at 7:30 p.m. Friday in Ethington Theatre. Ticket information and more details are here. Tickets: Click here or call the box office at (602) 639-8880. By Ethington standards, the play has a small cast, just eight main parts for students, plus six others as understudies. An added plus: The role of the neighborhood boy, Bert, is being shared by John Cotoia, 11, and his brother Nicholas, 10, sons of John Cotoia, a GCU manager of faculty training and development. Natalie Ward (center) said the role of Kate Keller is a new experience for her. GCU sophomore Jamie Coblentz, a Miller fan from way back, will play Ann Deever, who has been involved with both of Keller’s sons. 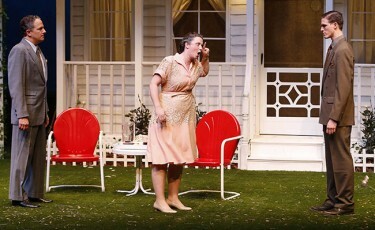 Coblentz is more accustomed to playing the mother, not the ingénue. Senior Natalie Ward said she wasn’t expecting to be cast as Kate Keller, Joe’s wife. But as the eldest of seven children in her family — and a military family at that — Ward has a lot to work with. Her own mother is fiercely protective of her children, as is Kate, but the similarities between the two end there, Ward said. “Kate talks about having raised her kids to have principles, but what she’s really saying is, ‘Here, you need to get a job and settle down and forget about principles,’” Ward said.